Unusual 1920s Alexander Ritchie hatpin, with scroll design on the top section, and marked AR and IONA on the reverse. The top section freely moves backwards or forewards in its housing, and there is a delicate spiral boss on the reverse of the latter. Overall length 6.5cms. 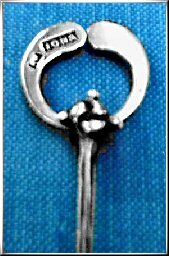 Rare silver and enamel hatpin by Alexander Ritchie. 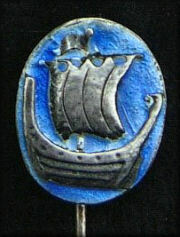 Longship design with a blue enamel background. 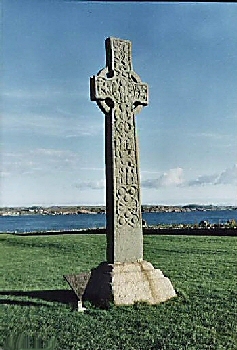 The reverse has three markings of AR, Iona, and ICA. No hallmark. Period 1931-1939. A most unusual pin. 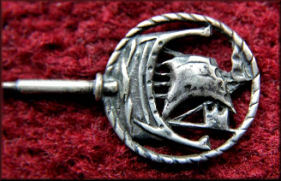 Silver hatpin with steel pin. 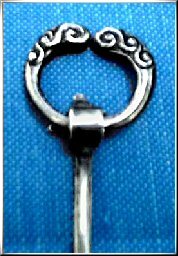 This is most unusual, as the pierced longship design is quite often seen as a Ritchie brooch, but I have never seen one which AR had made as an Iona hatpin. The overall length is 16cms (with a seriously sharp steel pin (! 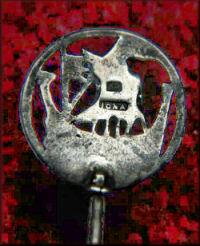 ), and the sterling silver longship head is 2.5cms in diameter, with reverse markings of AR (conjoined) and IONA. This is an early piece from the unhallmarked silver period, c.1910-1915.